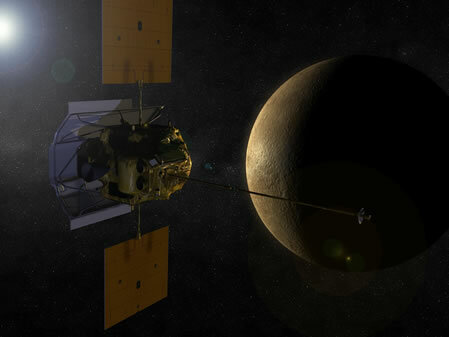 Photo: An artist’s concept shows the MESSENGER spacecraft in orbit around Mercury. Credit: NASA. NASA’s MErcury Surface, Space ENvironment, GEochemistry, and Ranging (MESSENGER) spacecraft entered orbit around Mercury March 17, becoming the first spacecraft to ever do so. While orbiting Mercury, MESSENGER’s instruments will perform the first complete reconnaissance of the planet’s geochemistry, geophysics, geologic history, atmosphere, magnetosphere, and plasma environment. 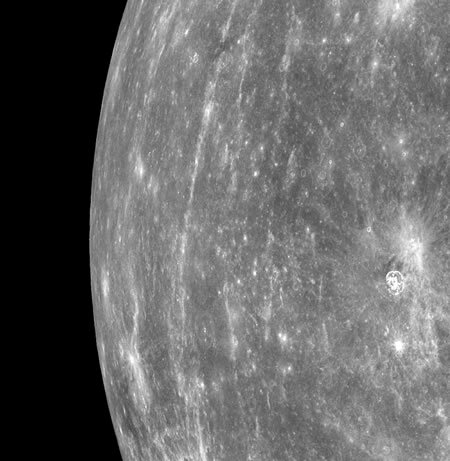 On March 29, the Mercury Dual Imaging System was turned on and began capturing the first of thousands of orbital images. Photo: From Orbit, Looking toward Mercury’s Horizon. MESSENGER acquired this image of Mercury’s horizon as the spacecraft was moving northward. Credit: NASA, Johns Hopkins University Applied Physics Laboratory, and Carnegie Institution of Washington. Photo: The first French model to achieve international acclaim, Madame Ines de la Fressange, is now joining the family of Ambassadors for L’Oreal Paris. (Foto © L’Oreal Paris). The extremely active mother of two daughters, the new L’Oreal Paris Ambassadress Ines de la Fressange has just published her Fashion Style Guide “Parisian Chic”. 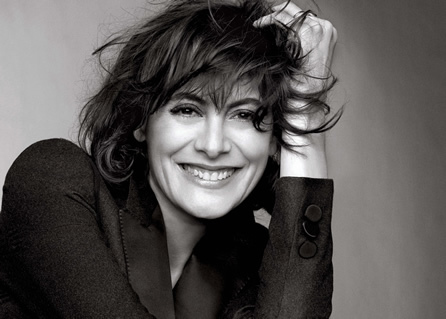 In 1991 she created her own brand “Ines de la Fressange”, and in 2008, for her 50th birthday, she appeared on the cover of ELLE France. “Ines de la Fressange, our new L’Oreal Paris spokeswoman, has divine grace, that very contemporary way of being a woman, at once free, unexpected and mesmerizing. An accomplished model, mother and designer, she leads a full life. I am delighted that she is bringing that irresistible ‘je ne sais quoi’ to the brand,” said Cyril Chapuy, Global Brand President of L’Oreal Paris. 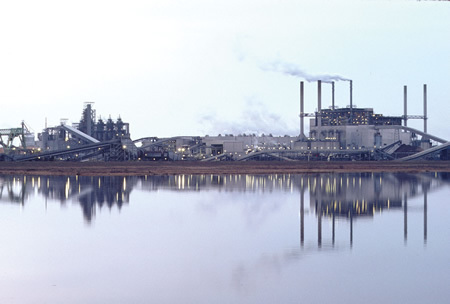 Photo: International Paper’s Mansifled, LA, mill — one of six containerboard packaging mills the company operates in the U.S. (Courtesy of International Paper). International Paper (NYSE: IP) has entered into agreements with Mr. L.N. Bangur, and related family members and affiliates to purchase approximately 53.5 percent of the outstanding shares of Andhra Pradesh Paper Mills Limited (NSE: APPAPER) for approximately US$257 million in cash. In addition, International Paper has agreed to a US$62 million non-compete payment to the sellers. Once completed, the transaction will position International Paper as the first global paper and packaging company with a significant position in India’s fast growing economy. “APPM is an established and highly respected company in India, and is an excellent platform for International Paper to grow with the Indian paper and packaging markets,” said John Faraci, chairman and chief executive officer of International Paper. The share purchase and public tender are expected to be completed as early as the third quarter of 2011, subject to regulatory and other approvals, including the Security and Exchange Board of India (SEBI), the Reserve Bank of India (RBI), and, if applicable, the Competition Commission of India (CCI). The Andhra Pradesh Paper Mills Limited (APPM), part of the Kolkata Based L.N . Bangur group, established in the year 1964, is a leading manufacturer of pulp and paper products and caters to both the domestic and foreign markets. While, International Paper (NYSE: IP) is a global paper and packaging company with manufacturing operations in North America, Europe, Latin America, Russia, Asia and North Africa. It is the largest pulp and paper company in the world. Headquartered in Memphis, Tennessee, USA, the company employs about 59,500 people in more than 24 countries and serves customers worldwide. In a major global music relief effort to benefit those affected by the earthquake and tsunami in Japan, over 30 of the biggest names in contemporary music have joined together for the worldwide release of “Songs for Japan,” an unprecedented compilation of 38 chart-topping hits and classic tracks, available worldwide on the iTunes Store for $9.99 starting today. 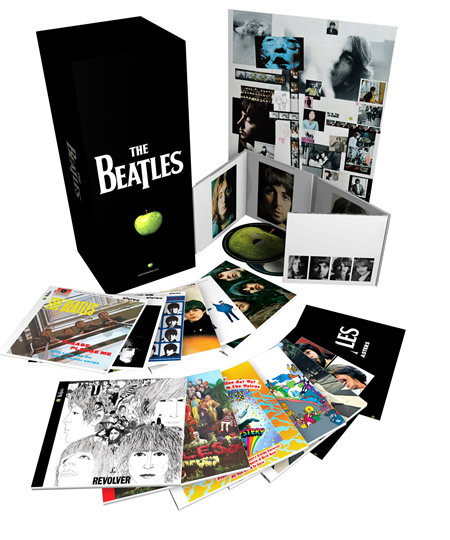 Proceeds from the album’s sale will benefit the disaster relief efforts of the Japanese Red Cross Society. Proceeds from “Songs for Japan” will be directed to the Japanese Red Cross Society to support its disaster relief efforts. The society will use the funds for the ongoing provision of immediate relief and for eventual recovery support to the affected population. 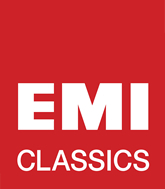 The artists participating on “Songs for Japan,” the music labels and music publishers have waived their royalties and proceeds from the worldwide sales of the album to ensure that the Japanese Red Cross Society receives as much support as possible from this global initiative. 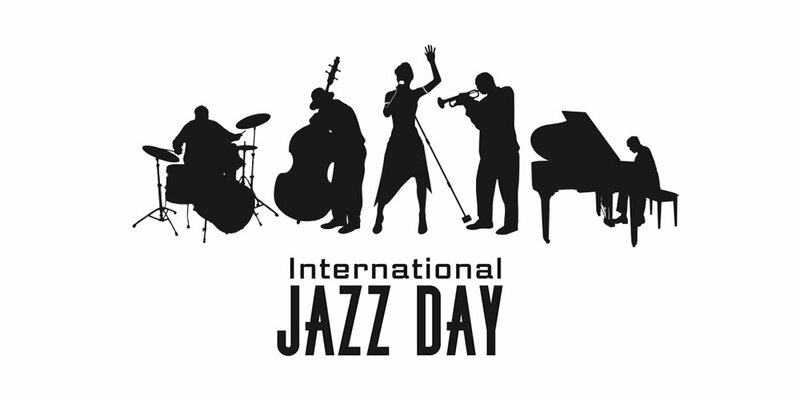 Source: Universal Music Group, Sony Music Entertainment, Warner Music Group, and EMI Music. 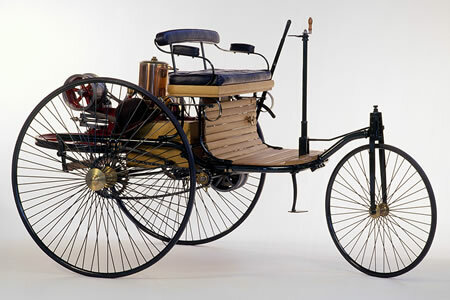 Photo: Benz Patent Motor Car, 1886 - the world’s first automobile. Photo © Mercedes-Benz, Daimler AG. On 29 January 1886, Carl Benz files a patent application for his “vehicle with gas engine operation”. Patent application DRP 37,435 can be regarded as the birth certificate of the automobile and helps to coin the name “patent motor car”. The world’s first automobile is an independent design in which engine and chassis form an organic unit. Benz, unconvinced by the conventional drawbar steering used on the carriages of the day, builds his automobile in the form of a three-wheeler. Carl Benz’s key achievement consists in the determination with which he makes reality his vision of the “horseless carriage”: he conceives the idea of a motor car, designs it, constructs it, patents it, tests it, markets it, produces it in series, refines it, thereby making his invention usable. The Benz patent motor car heralds a new age of personal mobility. 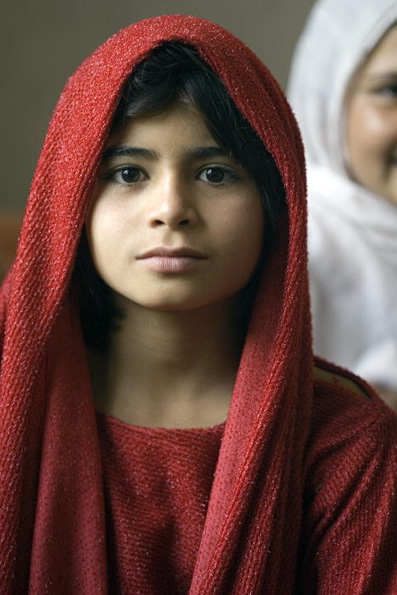 Photo: Portrait of one of the young girls in the Kapisa Province of Afghanistan who are receiving Vocational Education and Training. Photo © United Nations/Eskinder Debebe. The UN Security Council has unanimously adopted a resolution extending the mandate of the United Nations Assistance Mission in Afghanistan (UNAMA) until March 23, 2012. Photo: Goodyear Assurance Fuel Max is a fuel-efficient tire that provides confident wet and dry traction. Goodyear Asia Pacific has launched its latest tire from its award-winning Assurance line, the Goodyear Assurance Fuel Max with Fuel Saving technology, which, according to Goodyear, provides 4% more fuel efficiency and 15% longer mileage than conventional tire technology. As Goodyear explains, this tire is designed for family cars in the mid and premium markets and consumers who are looking for value for money and safety can now achieve maximum fuel efficiency and maximum protection with this new tire. “In the current environment where the rising fuel costs are a huge concern, Fuel Max technology is designed to improve fuel consumption without compromising on mileage or performance,” said Rajeev Anand, Vice Chairman and Managing Director, Goodyear India. Photo: Goodyear Blimp flying over Akron, Ohio. Meanwhile, in the USA, the Goodyear Assurance Fuel Max has earned the Good Housekeeping Seal, after evaluation by the Good Housekeeping Research Institute. 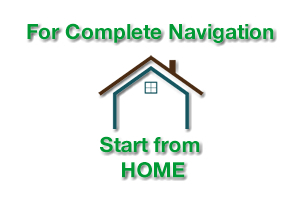 “This is just another reason to select Assurance Fuel Max, on top of the already well-recognized consumer benefits. The Good Housekeeping Seal offers high recognition and influence for products that have earned it,” said Gary Medalis, Goodyear brand general manager. Headquartered in Akron, Ohio, USA, Goodyear is one of the world’s largest tire companies. It employs approximately 69,000 people and manufactures its products in more than 57 facilities in 23 countries around the world. Photography: Mongolian Boy Lassoes a Distracted Goat in the Herd. Photo: Mongolian boys, one mid-lasso, shepherd their herd of goats in Khovd Aimag. The UN Development Programme (UNDP) works to empower herder groups in the area — many herdsmen now develop their own land-use plans, conservation maps and sustainable practices for water, forest and pasture management. Khovd Aimag, Mongolia. UN Photo/Eskinder Debebe. • Lasso is a light, strong rope, usually with a smooth, hard finish, made of a fine quality of hemp or nylon. It is used primarily for catching large animals such as cattle and horses. The rope varies in length from 35 to 50 ft (11-15 m). At one end of the rope is a running knot or a metal ring by means of which a loop or noose is made. The loop is thrown, from as far away as 30 ft (9 m), around the horns or the feet of an animal and drawn tight. The lasso was invented by Native Americans. In the West United States and in parts of Latin America the lasso is a part of the equipment of a cattle herder. To use it on horseback requires great skill of the rider. Photo: PARIS, FRANCE. March 18, 2011 — Designer and perfumer Thierry Mugler has chosen international star Eva Mendes to personify his fragrance ANGEL. ANGEL was created in 1992 and is one of the top five best-selling women’s perfumes in the world. Longines Master Collection Retrograde Moon Phases. Longines has succeeded for the first time in bringing together the day, the night and the phases of the moon in a symphony of retrograde hands with a new timepiece that is named the Longines Master Collection Retrograde Moon Phases. This exceptional watch reveals the intricate symphony of four retrograde hands whose movements are governed by the phases of the moon and the rhythms of day and night. 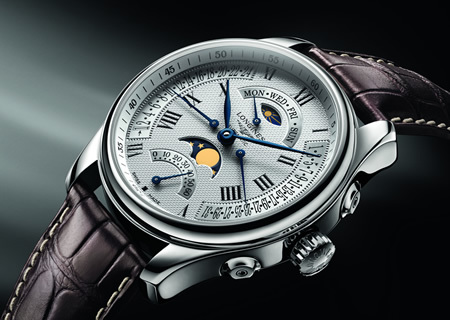 In addition to displaying the hour, day, night and the phases of the moon, the functions of the Longines Master Collection Retrograde Moon Phases models include the day of the week at 12 O’Clock, the date on the right-hand side of the dial, a 24-hour second time-zone on the left-hand side of the dial and a small seconds at 6 O’Clock. These four functions are retrograde, in other words, the hands that display this information return immediately to their former position once they have completed their cycle. The elegant and harmonious movement of the six hands under the eye of the moon makes this new creation totally captivating. Longines is a member of the Swatch Group and is based in St. Imier in Switzerland since 1832. It has outlets in over 130 countries. 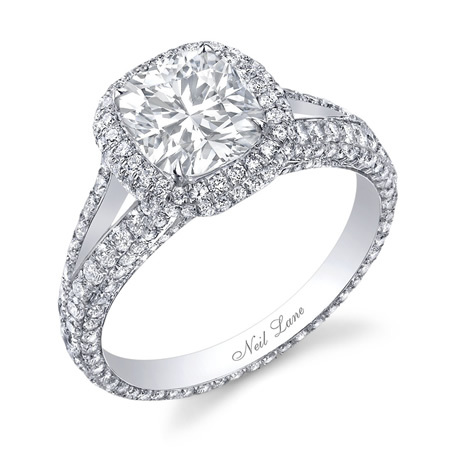 Photo: Diamond and platinum ring, set with a central cushion cut diamond, further accented with 263 round brilliant cut diamonds, approximate total diamond weight — 3 carats, hand-crafted, designed and signed by Neil Lane. Neil Lane is Hollywood’s celebrated jewelry designer. 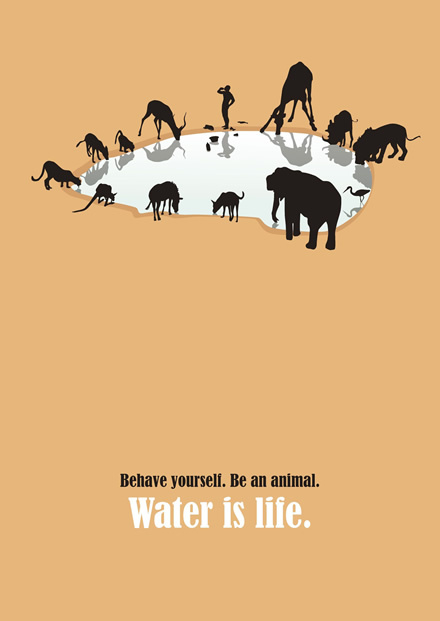 International Poster Art Shows: Water is Life! Photo: Winning Poster by Pawel Dadok, Poland. ‘Water is Life’. Under this slogan, the German Sanitation, Heating and Air Conditioning Association (ZVSHK) held an international poster competition in which 4,862 artists from 83 countries took part. “With our poster competition, we wanted to address the problems caused by water shortage and water wastage on a worldwide scale. The competition seeks to raise people’s awareness of how important it is to have secure access to clean drinking water,” explained Manfred Stather, the President of the ZVSHK, at the award ceremony in Frankfurt. One Million Tickets to London 2012 Olympics Reserved for Fans Outside the U.K. and E.U. 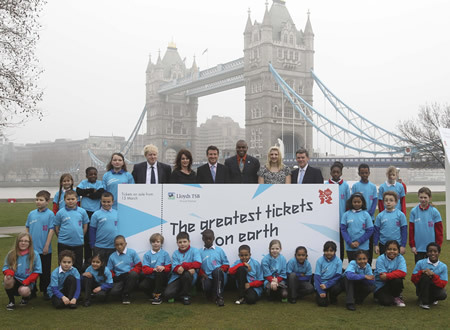 Photo: London Olympic Organizing Committee Chairman Sebastian Coe joins London school children, Olympic gold medalists Carl Lewis (USA) and Nadia Comaneci (Romania), British swimmer Rebecca Adlington and London Mayor Boris Johnson to announce that the application process is now open for tickets to the London 2012 Olympic Games. Photo: 11-Year-Old Boy From India to Be Awarded Lions International Peace Poster Contest Grand Prize at the United Nations. 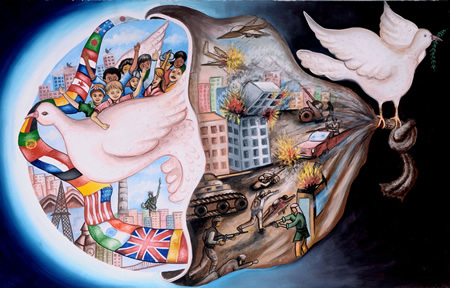 Raj Phairembam, an 11-year-old boy from Manipur, India, will be recognized at Lions Day with the United Nations in New York City for winning this year’s grand prize in the Lions International Peace Poster Contest. At the event on Friday, March 18, 2011, Phairembam will receive an award and US$5,000. Phairembam said when he found out he won, he was overwhelmed with disbelief and excitement. Lions created the Peace Poster Contest to foster a spirit of peace and international understanding in young people worldwide. • Lions Clubs International is the world’s largest service club organization with 1.35 million members in more than 45,000 clubs in 206 countries and geographic areas around the world. 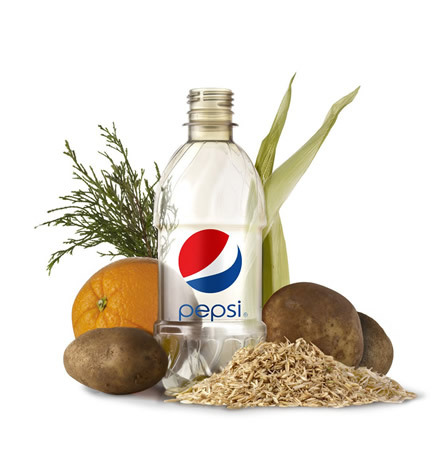 PepsiCo today announced it has developed the world’s first PET plastic bottle made entirely from plant-based, fully renewable resources, enabling the company to manufacture a beverage container with a significantly reduced carbon footprint. According to PepsiCo, its “green” bottle is 100 percent recyclable and far surpasses existing industry technologies. The bottle is made from bio-based raw materials, including switch grass, pine bark and corn husks. In the future, the company expects to broaden the renewable sources used to create the “green” bottle to include orange peels, potato peels, oat hulls and other agricultural byproducts from its foods business. 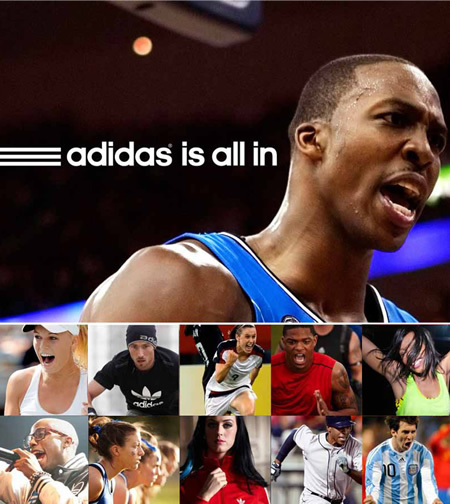 • adidas today unveiled the “all adidas” global brand campaign. The campaign showcases adidas’ distinctive presence across different cultures and lifestyles fusing the world of sports, music and fashion. The new campaign, launching March 16, captures the passion athletes, musicians and artists put into their “game”. The campaign is directed by Romain Gavras and features the song “Civilization” by French electronic band Justice. The campaign is built around a 30- and 60-second TV commercial and a two-minute extended online version. • adidas designs and develops a broad range of athletic and fashion footwear, apparel and accessories. Brand adidas is part of the adidas Group that includes adidas, Reebok, TaylorMade and Rockport. 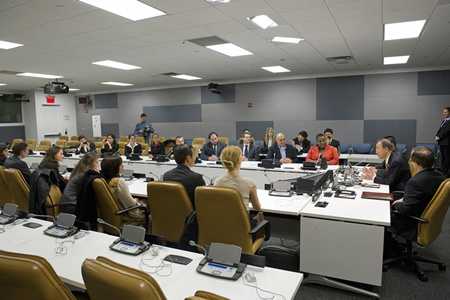 Photo: Secretary-General Ban Ki-moon (second from right) meets with students from Harvard University’s Kennedy School of Government. March 11, 2011. United Nations, New York. UN Photo/Eskinder Debebe. 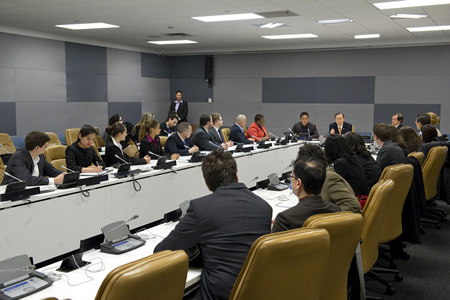 Photo: Secretary-General Ban Ki-moon (head table, centre) meets with students from Harvard University’s Kennedy School of Government. March 11, 2011. United Nations, New York. UN Photo/Eskinder Debebe. 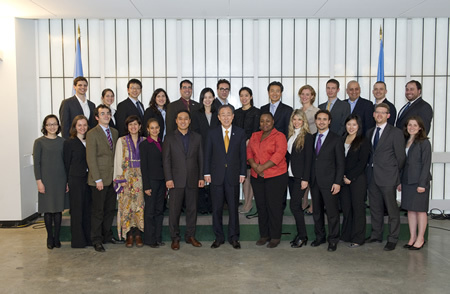 Photo: Secretary-General Ban Ki-moon (front, centre) poses for a group photo with students from Harvard University’s Kennedy School of Government. March 11, 2011. United Nations, New York. UN Photo/Eskinder Debebe. 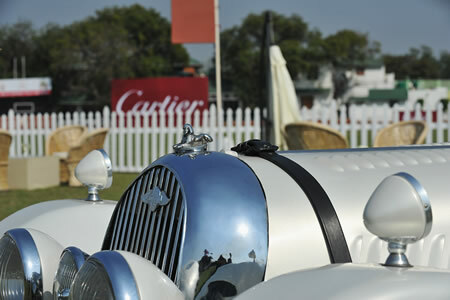 Cartier ‘Travel With Style’ Concours showcased an extraordinary collection of India’s unique Classic Cars at The New Delhi Jaipur Polo Club. • Owned by Indian royalty and private collectors, some of the most rare and historically significant automobiles were on display in public for the first time. 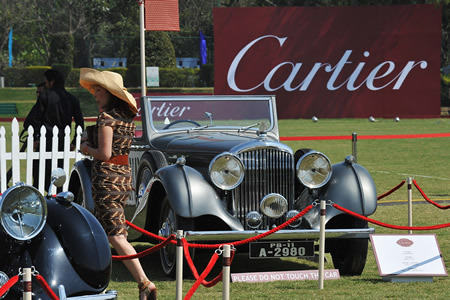 Photo: General Atmosphere during the Cartier ‘Travel With Style’ Concours on March 12, 2011 in New Delhi, India. (Photo © Pascal Le Segretain/Getty Images for Cartier). The highlight of the Classic/ Rolls-Royce Class was the 1911 Rolls-Royce 40/50 H.P. One of the most famous cars in the world, this Silver Ghost, known as the ‘Throne Car’, was ordered by the H.H. Mahbub Ali Khan, Nizam VI of Hyderabad, the richest man in the world of that era. It is one of the most legendary, unique and expensive cars that Rolls-Royce ever manufactured. The car was delivered in 1912. Some of the other cars in the concours included the ones originally bought by H.H. The Maharaja of Bharatpur, H.H. The Maharaja of Darbhanga, H.H. The Maharaja of Jodhpur, H.H. The Maharaja of Mayurbhanj, H.H. The Maharaja of Indore, and H.H. The Maharaja of Patiala. Photo: A detail of a Morgan 4/4 1951 is seen during the Cartier ‘Travel With Style’ Concours on March 11, 2011 in New Delhi, India. (Photo © Pascal Le Segretain/Getty Images for Cartier). 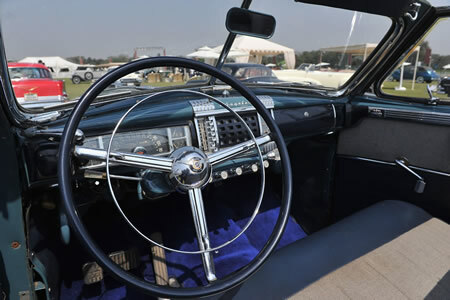 Photo: A Chrysler Windsor 1947 is seen during the Cartier ‘Travel With Style’ Concours on March 11, 2011 in New Delhi, India. (Photo © Pascal Le Segretain/Getty Images for Cartier). 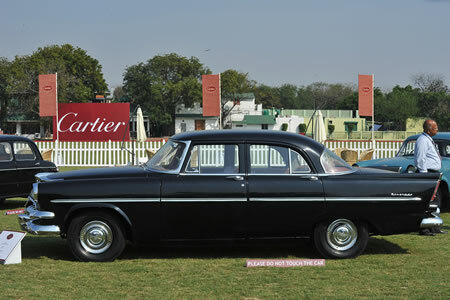 Photo: A Dodge Kingsway 1955 is seen during the Cartier ‘Travel With Style’ Concours on March 11, 2011 in New Delhi, India. (Photo © Pascal Le Segretain/Getty Images for Cartier). Photo: A detail of Stutz Le Baron 1930 is seen during the Cartier ‘Travel With Style’ Concours on March 11, 2011 in New Delhi, India. (Photo © Pascal Le Segretain/Getty Images for Cartier). 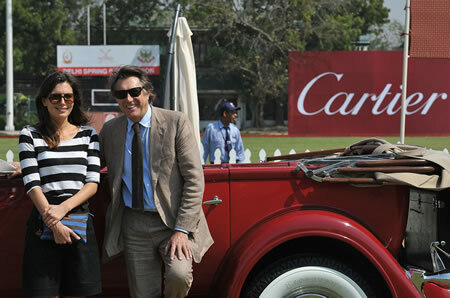 Photo: Singer Brian Ferry (R) and Amanda Sheppard pose in front of a Packard Super 8 1934 during the Cartier ‘Travel With Style’ Concours on March 11, 2011 in New Delhi, India. (Photo © Pascal Le Segretain/Getty Images for Cartier). 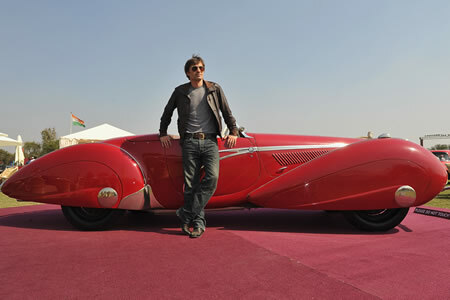 Photo: Actor Olivier Martinez poses in front of the Delahaye car winner of the Cartier “travel with Style” 2008 edition during the Cartier ‘Travel With Style’ Concours on March 11, 2011 in New Delhi, India. (Photo © Pascal Le Segretain/Getty Images for Cartier). 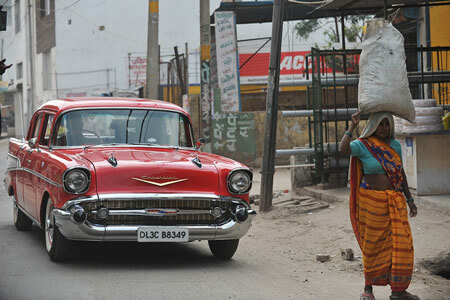 Photo: The Chevrolet BelAir 1955 of Mr. Diljeet Titus is on its way to the Cartier Travel with Style Concours on March 10, 2011 in New Delhi, India. (Photo © Pascal Le Segretain/Getty Images for Cartier). Photo: President and CEO of Cartier International Bernard Fornas poses during the Cartier ‘Travel With Style’ Concours on March 11, 2011 in New Delhi, India. (Photo © Pascal Le Segretain/Getty Images for Cartier). 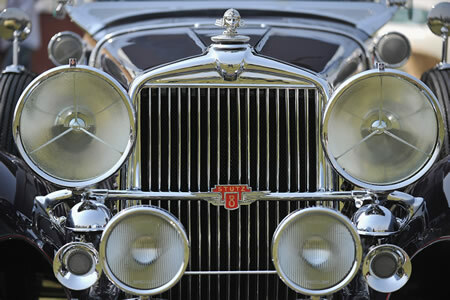 Photo: A Maybach 1936 SW 38 is seen during the Cartier ‘Travel With Style’ Concours on March 12, 2011 in New Delhi, India. (Photo © Pascal Le Segretain/Getty Images for Cartier). Photo: Mr. Diljeet Titus arrives to reveive the award for classic class category during the Cartier ‘Travel With Style’ Concours on March 12, 2011 in New Delhi, India. (Photo © Pascal Le Segretain/Getty Images for Cartier). Photo: A Jaguar Mark IV 1947 is seen during the Cartier ‘Travel With Style’ Concours on March 12, 2011 in New Delhi, India. (Photo © Pascal Le Segretain/Getty Images for Cartier). The Cartier ‘Travel With Style’ Concours D’ Elegance was judged by an international panel of well known figures hailing from the automotive, creative, business, media, film, music, fashion and sporting worlds. Set to rank alongside the other world-renowned Concours, such as the Cartier ‘Style Et Luxe’ at the Goodwood Festival of Speed; the ‘Concorsa D’Eleganza’ at the Villa D’Este; and the ‘Pebble Beach Concours D’Elegance’ in California; the Cartier ‘Travel with Style’ Concours has put India on the International Classic Car Circuit. Photo: Buddhist Master and Harvard Ph.D. Trungram Gyaltrul Rinpoche examines the proportions of a hand-made copper Buddha statue as the artist constructs it. World Center for Peace and Unity, a large Buddhist temple complex, is being built in Lumbini, Nepal, where Prince Siddhartha Guatama, the Buddha, was born in 583 B.C. Lumbini is a UNESCO World Heritage Site. The 48,600-square-foot structure’s central building, named Mahachaitya, is modeled on one of the surviving structures of Nalanda (Bihar, India) in order to recall the greatness of Nalanda University, the ancient Buddhist seat of learning that served as the Harvard of Asia from the 5th to 12th centuries A.D. Nalanda has been called “one of the first great universities in recorded history.” Some of its buildings were constructed by the Mauryan emperor Ashoka the Great. At its peak, the university attracted scholars and students from as far away as China, Greece, and Persia. Courses were drawn from every field of learning, foreign and native, that included science, astronomy, medicine, scriptures (all religions), metaphysics, and logic. Photo: Executives from PepsiCo and Yale University gather to celebrate the opening of PepsiCo’s long-term research laboratory in New Haven, Connecticut, where the company will focus on the development of healthier products. The company also announced it will fund a M.D. 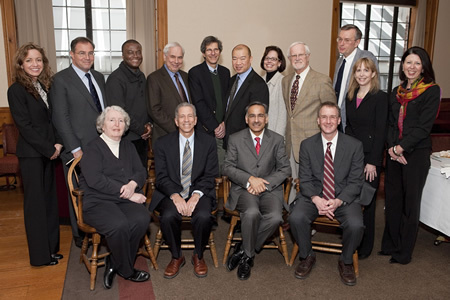 - Ph.D. fellowship at Yale University School of Medicine. A university’s brand - crucial in helping to attract students, staff and funding - is built on esteem. Times Higher Education’s first World Reputation Rankings reveal how academics view the strength of institutions’ teaching and research. The results of the first Times Higher Education World Reputation Rankings is based on an invitation-only survey of more than 13,000 academics around the world. 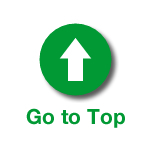 The world regards an elite group of six universities as being head and shoulders above the rest. The rankings suggest that the top six - Harvard University; Massachusetts Institute of Technology; the University of Cambridge; the University of California, Berkeley; Stanford University and the University of Oxford - form a group of globally recognized “superbrands”. “In an increasingly competitive higher education marketplace, branding has become big business for universities. Institutions know that, in a sense, the degrees they confer are worth only as much as their brand. In nations where tuition fees are established, students “buy” a brand that will appeal to the right businesses when it is time to find a job; their choice of university will become part of their own “brand identity”. To attract the right calibre of academics, a university relies on its brand. And when those same academics submit a proposal for research funding or a paper to a leading journal, the brand of their institution may play a role in how their research is judged. The university’s brand becomes part of their own brand as an academic. The notion of a university as a brand is one that many in higher education are comfortable with. But there are others, who warn that by focusing on branding, universities promote a view of higher education as a commodity rather than as a good in itself. But if a university is a brand, a key factor determining its strength is reputation in teaching and research (brand and reputation are distinct but related). And the views of academics on university reputation are crucial, for they give an insight into which institutions are best placed to attract top talent, and also influence the views of students and parents. The results of the first Times Higher Education World Reputation Rankings shed light on this increasingly important measure. The reputation ranking is drawn from a survey of more than 13,000 experienced academics worldwide, carried out by polling company Ipsos for data provider Thomson Reuters. The data informed the current Times Higher Education World University Rankings 2010-11, but are now published in isolation for the first time, revealing clear discrepancies between some institutions’ reputations and their overall ranking. One notable surprise is the strong performance of Japanese institutions, with the University of Tokyo, Kyoto University and Osaka University all performing better in the World Reputation Rankings than they did in the World University Rankings. Japan has five institutions in the reputation top 100, making it the best performer behind the US and the UK and producing a better score than major higher education nations such as Canada and Australia. The US remains dominant in reputation, taking 45 of the places in the top 100. The UK universities generally do better in the reputation rankings compared with their overall rankings. • “India, despite having no representative in the top 200 of the World University Rankings, can boast of one in the reputation table — the Indian Institute of Science (in the 91-100 band),” John Morgan points out. Reputation and brand are not the same thing. 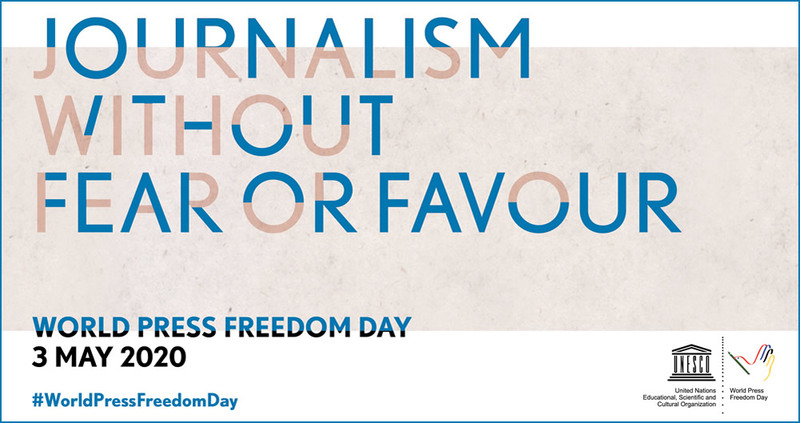 But Pat Freeland-Small, chief marketing officer at the University of Melbourne, says the former feeds the latter. — Aesop’s Fables. By Aesop (620-564 BC). Translated by George Fyler Townsend.